The unseen qualities of the Divine have been present since the world came into existence. The eternal power and divine nature of the Creator is instilled in us through Spirit to bring to pass immortality and eternal life. We are each immortal beings of spirit manifested in these physical vessels of this three-dimensional life experience. The physical vessel is mortal and the soul is immortal. As eternal beings of light, we are partakers of divine nature. Our divine nature is the well-spring of our spiritual wisdom. There is something of divinity within each of us that is a reflection of who we really are, where we are from and where we are going. Within us is the warm comforting inner peace of the soul that is evidence of our divine nature. This is what calls us to quiet reflection and meditation, and what feels so blissful in the quiet moments alone with our souls. This divine nature is the source of our soul memories, the reminder of what is genuine in a world where all is not, and the place in our hearts where only love abides. When we carry out our life experiences from this place of unconditional love, being in harmony and at one with all that exists, we exercise and elevate our divine nature. Namaste! Roughly translated, this gesture/greeting means "I see and honor the divinity that is within you and within me." The word "Sambhala" is found in the earliest Sanskrit manuscripts of Kalacakra texts and was transliterated by the Tibetans as "Shambhala", which means the place of inner peace and tranquility. Today we have come to use the word "Shamballa" to refer to the state of awareness in which we are in alignment with divine purpose. Shamballa is the inner connectedness of unconditional love to the Divine Source of the creator, the omnipotent and all that is. It is the awareness of the I Am; of Divinity. Divine Source is the I Am presence of celestial Spirit that is both omnipotent (fully powerful) and omniscient (fully aware). As we turn our awareness to the inner sanctuary of compassion, wisdom and divine essence we come into alignment with Divine Source. This consciousness of the highest realms of transcendental light enlarges our awareness of a higher aspect of ourselves. This acknowledgement of the divinity within is the salutation of the soul. Soul energy is the divine expression of Spirit within. When we think of the word nature we think of the material world which we inhabit; the natural scenery around us. When we speak of the "nature" of something we are referring to the fundamental qualities or essential character of it. If we say that something is "natural" we are stating that it is in the condition of its normal or principal state of being; its "nature". The natural state of our planet is the nature scenery that comes to mind. The natural state of a human being is the physiological makeup of mankind. The natural state of spirit is something quite different. Our spiritual nature is light and love. Many eloquent words have been spoken to describe the nature of spirit, and the fundamental principle of the spiritual essence of all living creatures can be reduced to the simplest forms of light and love. Divine nature is the highest spiritual essence of light and love. It is the substance of spirit in its purest form. We find inner peace and love for our fellowman when we meditate in the space of our higher selves, our inner spirits. We exalt our spirits when we envisage divinity; divine nature. The souls that we are were born of divine nature. Connecting with Divine Source renews and replenishes divine nature within us. We have many soul memories stirring within us. When we pay attention to this inner wisdom; this essential love, our souls flourish; our spirits soar; our hearts grow. To be sacred is to be declared holy, worthy of respect, dedicated or devoted to a purpose, consecrated. There is sacredness in holy places and in sanctification through spiritual rituals, and there is sacredness in life itself. When we consider life sacred, we give sincere appreciation for the air we breathe, the sky above and the earth beneath. We honor and respect all that we see, touch and experience. We demonstrate our reverence for that which we hold sacred by making space for it in a physical space that is clean and honorable, and by making space for it in our lives. We honor the space of sacredness. Honoring sacred space is taking the time to clear our minds and space, to quietly give our attention to what is sacred, and to be in the space of sacredness. In this space we merge with Divine Source in humility as we become one with inner peace, harmony and unconditional love. 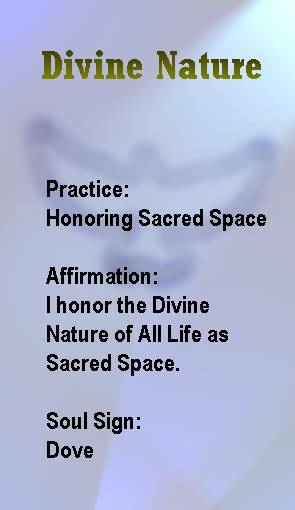 Follow these steps as a spiritual practice in honoring sacred space. Prepare the area by making it clean and tidy, and removing anything inappropriate. Clear yourself of negativity and clear your thoughts of anything unworthy of solemnity. Focus your thoughts on the emptiness of the inner space of our soul until you find the space of pure love and peace. In this inner space of peace, turn your awareness to what you desire to honor as sacred. Be in the space of quiet reverence with the object of our devotion and respect. Share the energy of your love from your heart. Allow yourself to experience being in the space of sacredness. As you return your focus to the experience of being human in physical form, bring the peaceful feeling of sacredness into your current life experience. The dove is commonly used as a symbol for love, peace and spirit. In Christianity is represents the Holy Spirit. When you ponder on the peaceful flight of the dove and allow your soul to take flight in the vast freedom of peaceful bliss in your imagination you discover that the closest thing on earth to the dance of Spirit is this display of seemingly weightless graceful flight of this sublime white creature in flight of grandeur. The dove symbolizes inner spirit. Affirmation: I honor the Divine Nature of All Life as Sacred Space. Please feel free to LIKE or TAG yourself on any affirmation card on the FaceBook page if you like it and would like to remember or share it. 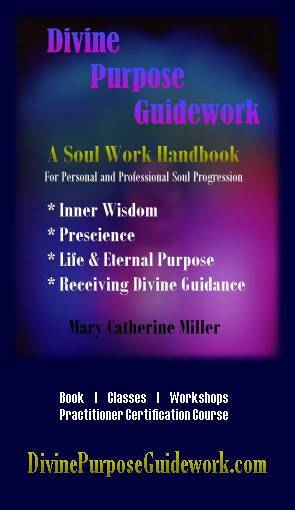 * A full deck of affirmation cards is planned for publication after the book is published. Currently the artwork is not complete and the publisher has not yet been selected. There is, however, an introductory 12-card presentation set available ONLY at workshops. The first set is free to registered workshop participants, and each participant will have the opportunity to purchase additional sets at the workshop for a very modest cost. Card graphics are available for download in JPEG and PDF formats. Each card refers to the chapter subject and spiritual practice while including a related affirmation and a visual/mental clue to remember from within, a "soul sign."